Our theoretical perspective is the institutional materialist evolutionary world-systems approach. This perspective focuses on the ways that humans have organized social production and distribution, and how economic, political, and religious institutions have evolved in systems of interacting polities (world-systems) since the Paleolithic Age. We employ an underlying model in which population pressures and interpolity competition have always been, and still remain, important causes of social change, while the systemic logics of social reproduction and growth have gone through qualitative transformations (Chase-Dunn and Hall 1997: Chapter 6). Thus we are both continuationists and transformationists. This paper will focus mainly on the evolution of economic institutions and the roles played by semiperipheral polities in the long-term commodification of goods, wealth, labor and land. It uses the results of a research project that studies the development of settlements and polities by comparing regional world-systems and studying them over long periods of time. Here we start with a brief stylized overview of our version of the evolution of qualitatively distinct economic institutions and then we will elaborate and qualify this model by examining some particular cases. In small-scale and egalitarian systems social production is mainly based on shared conceptions of norms that designate obligations among members of kin groups. Anthropologists call this the kin-based mode of production (Wolf 1997). It is based on consensual moral orders that are imbedded in the mother tongues that people learn from childhood. The mobilization of social labor is primarily organized by means of family obligations based on sharing and reciprocity. In some of these small-scale societies there is also ritualized (sacralized) gifting that reinforces alliances across households, settlements and sometimes across the boundaries of independent polities (Douglas 1990). Most of these small-scale systems are egalitarian in the sense that there may be some gender and age inequalities, but there are few inequalities across households. As sociocultural systems become more complex, hierarchical kinship distinctions emerge that allow elites to use institutionalized power to accumulate resources and to regulate the uses of land and other valuable natural resources. Classes, forms of property and prestige goods systems emerge that make it possible for the chiefly elite to appropriate some of the labor and goods produced by commoners. In some of these systems prestige goods emerge as a mechanism for symbolizing alliances among village heads. Under some conditions prestige goods can evolve into proto-money that serves as a more generalized symbol of value in trade networks. The function of such intervillage exchange is to allow surplus food to be acquired by villages that are experiencing a temporary shortage. Intervillage and interpolity trade serves as a substitute for raiding. In some systems prestige goods are monopolized by the elites and are used to reward subalterns and to regulate marriage, reinforcing the political hierarchy. These are called “prestige goods systems” in the anthropological literature. But some egalitarian systems have prestige goods or proto-money that mainly functions to ensure the provision of goods for the general population during periods of shortage (e.g. the Wintu – see Chase-Dunn and Mann 1998). Small-scale societies also differ in the extent to which private property exists. Many have only the usufruct in which procurement locations are reallocated yearly by group decision-making, whereas others designate property rights to individual sites that are inherited. But even when individual or household rights to sites exist these are not commodified because they cannot be bought or sold. In some systems specialized institutions of regional control emerged within polities that were separate from, and over the top of, the kin-organized subsistence and political economy. These were the first states, and the larger political economy came to be based on various forms of tithing, taxation, labor-appropriation and tribute. The general term for this kind of political economy is the tributary mode of accumulation. In some of the early states primordial versions of commodified exchange emerged such as lending money at interest and letters of credit, but most exchange continued to be regulated by customary or politically-specified rules and rates of exchange. Interpolity (foreign) trade was usually carried out by representatives of the state – what Polanyi (1957a) called “state-administered trade.” But there were also some city-states that specialized in trade. The commodified institutions that emerged within early tributary states were surrounded by powerful state-based institutionalized coercion that regulated most of the economy. For thousands of years commodified forms of wealth, land, goods and labor existed within political economies in which institutionalized coercion was the predominant mode of economic regulation. But these commodified forms nevertheless spread and developed within and between the tributary empires. Tributary states became semi-commercialized and more and larger semiperipheral capitalist city-states specializing in trade and commodity production emerged. Eventually a rather highly commodified system emerged in Western Europe during the period after the fall of the Roman Empire in which the power of tributary states was weak. A large number of semiperipheral capitalist city-states concentrated first on the Italian peninsula and then spread across the Alps to the low countries and then to the North Sea and the Baltic. These were agents of an expanding Mediterranean and Baltic market economy. When territorial states again emerged the most powerful of them were shaped by the existence of this strongly commodified regional market economy, and the emergent political elites were dependent on support from merchants and bankers to meet the costs of raising armies in this very competitive interstate system. The first territorial core state (not a semiperipheral city-state) that was controlled by capitalists was the Dutch federation in the 17th century. This signaled the arrival of a capitalist world-system in which the logic of profit-making instead of tribute-gathering had moved from the semiperiphery to the core. The above stylized overview depicts the emergence of money and market exchange as first occurring in the context of Bronze Age state-based world-systems. But we want to have a closer look at something of interest that happened in some stateless systems. Our tendency is to side with the substantivists in the debate over whether or not market exchange existed in stateless world-systems but we are willing to be persuaded if there is evidence to the contrary. The substanvists contend that there was no market exchange before the emergence of states, while the formalists think that all societies use the same logic with regard to the rational individual calculation of gain and loss. Since Karl Polanyi and his colleagues developed the substantivist approach to economic sociology in the 1950s a debate has waned and waxed among archaeologists, anthropologists, historians and sociologists over the "substantivist/formalist" question. The substantivists argue that exchange relations are embedded in social structures, and that markets are historically created institutions, not timeless logics expressing the truck-and-barter instincts of "economic man". Polanyi distinguished between three qualitatively distinct forms of integration: reciprocity, redistribution and market exchange. Important statements of the substantivist position by Polanyi and his colleagues are contained in Polanyi, Arensberg and Pearson, eds. (1957). Marxist variants have been argued by Sahlins(1972) and Wolf( 1982). The formalists argue that economic rationality has similar properties in all human societies, and they emphasize the importance of rational choice approaches for nomadic foragers as well as contemporary consumers. The formalist perspective has been defended by Blanton , Kowalewski, Feinman and Appel( 1981).Curtin's(1984) study of cross cultural trade improves the formalist position by adding some new concepts: trade diasporas and trade ecumenes. Before the emergence of states human polities were small and not very internally stratified. The kin-based modes of production worked best in small-scale polities in which decisions could be made by consensus. Normative order requires a lot of consensus, and this works best when there are few socially structured inequalities. Sedentism and some degree of social complexity often emerged among some of those foraging peoples (hunter-gatherers) who occupied environments that provided enough food to sustain a settled population. These sedentary foragers developed methods of storing food for the off-season. They also sometimes developed trade networks that evened out the distribution of resources during years of drought or other climatic variations that affect the food supply. And trade allowed resources to move from ecological zones in which they were more abundant to zones in which they were scarce. Trade networks of this sort can be understood as an institutional substitute for raiding (Vayda 1967). Some of these systems developed proto-money in which a standardized symbol of value (usually beads made from sea-shells) came to be used as a form of social storage that facilitated intervillage exchange and allowed for the accumulation of tradable value that was less subject to spoilage than stored food. Sahlins’s (1974) concept of ‘balanced reciprocity” includes both the exchange of equivalent gifts but also “transactions which stipulate returns of commensurate worth or utility within a finite and narrow period. … The parties confront each other as distinct economic and social interests (194-5). His main effort is to differentiate balanced reciprocity from generalized reciprocity, not from market exchange, which he does not really consider because he is studying Stone Age Economics. He includes a lot of things in his category of “negative reciprocity” some of which could be arm-length market exchange in which there is no personal relationship between the buyer and the seller. For the problem of comprehending the institutional nature of the social economy in prehistoric California discussed below we need to make a clear distinction between balanced reciprocity and market exchange. The main difference seems to be intent. In balanced reciprocity the main intent is to be fair and to give as much as you get in order to reinforce a social relationship. With market exchange the intent is to make a profit. But this also requires a category of others that are more distant than kin, but not yet enemies. It is this category that emerges as the notion of kin-based solidarity expands to include co-ethnics, co-nationals and eventually the whole human species. Most of the band and tribal level groups that Sahlins is studying do all these forms of exchange without the use of a standardized symbol of value (money). But there are some exceptions. In some regions tribal groups do develop and extensively use a standardized medium of exchange. Sahlins (1972:227) calls this primitive money, by which he means “those objects in primitive societies that have token value rather than use value and that serve as means of exchange.” Sahlins (227) then designates a few regions in which small-scale societies are known to have made extensive use of primitive money: “western and central Melanesia, aboriginal California and certain parts of the South American tropical forest.” Sahlins’s claims that these exceptions constitute instances of balanced reciprocity, not market exchange. Sahlins contends that the use of primitive money for balanced reciprocity occurs under certain conditions: a course-grained ecology in which rather different ecological zones are close to one another, which encourages exchange; an intermediate level of segmentary tribal organization in which intervillage trade is between politically autonomous but culturally related groups, “transactions in durables, more likely to be balanced than food transactions(230)”. And he also says, “But more important, the proportion of peripheral-sector exchange, the incidence of exchange among more distantly related people, is likely to be considerably greater in tribal than in band societies” (228). Our purpose here is to examine the idea that there may be a relationship between semiperipherality and the emergence of specialized production of proto-money in world-systems of sedentary foragers. We define market exchange in the way that economists do – a price-setting market is one in which the terms of trade (prices) are set by competitive buying and selling among sets of purchasers and sellers who are trying to make a profit on the exchanges. Sharing, reciprocity, gift-giving, generalized exchange and the payment of tribute and taxes are not market exchange. Non-market exchanges rates sometimes reflect transportation and production costs, but this is usually because the exchangers are trying to be generous, and generosity involves guesses about how much effort was needed to obtain a valued thing. A market economy is one in which a majority of the goods and services that are necessary to the everyday lives of average persons are obtained by marketized buying and selling. Most egalitarian world-systems of sedentary foragers do not have stable core/periphery hierarchies in which some polities are able extract surplus product from other polities (e.g. Chase-Dunn and Mann 1998). But there is often a condition of core/periphery differentiation in which polities with greater population density and larger settlements frequently interact with polities with less population density and smaller settlements, or with nomadic peoples. Semiperipherality in a situation of core/periphery differentiation is constituted by having relative middle-sized settlements with middle-levels of wealth and that mediate relations between a core region and a peripheral region. In this paper we examine the hypothesis that semiperipheral communities may have been agents of the development of proto-money in small-scale world-systems. The regional world-systems of indigenous northern and southern California are used to test this hypothesis. In both regions the manufacturing of primitive money became a specialized activity of households that were in settlements that were of medium size relative to the sizes of those settlements that were larger and those that were smaller in adjacent regions. In both Northern and Southern California different kinds of proto-money emerged as important for intervillage exchange networks. In the north the Pomo villages located near Clear Lake in the Coast Range in between the Sacramento River Valley and the coast of the Pacific Ocean specialized in the production of clam disk shell beads. 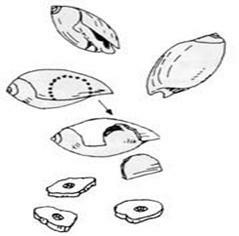 They obtained clam shells from the coast near Tamales Bay by means of direct procurement and by trade with indigenes living on the coast, and they labored to turn these shells into small disks with a hole drilled in the center. These disk beads were then strung and a standard length of strung beads came to serve as a symbol of value in an exchange network that extended both north and south in the Sacramento River Valley and the adjacent mountain ranges. The Pomo were hill dwellers living adjacent to the valley-dwelling Patwin, who had some of the largest settlements in indigenous California – up to about 1500 residents – along the lower Sacramento River. The Pomo villages were large but not as large as those of the Patwin. The Pomo were a linguistic group that spoke spoke different languages within the Pomo language family of the Hokan language phylum. As with other indigenous peoples of California, they were organized politically as “tribelets” – politically autonomous villages or small affiliated groups of villages that occasionally made war on one another but that also engaged in extensive trade in which food and other valuables were exchanged (Kroeber 1925). Prestige goods moved rather long distances by means of down-line-trade, moving from group to group. There were no long distance traders because it was dangerous to pass through the territories of non-allied groups. Long distance procurement treks were sometimes undertaken, but they were also dangerous. The most common cause of war was trespass, in which resources that were collectively owned by a tribelet were used without permission by outsiders (Chase-Dunn and Mann 1998: Chapter 8). In Southern California the Chumash villages along the Santa Barbara coast, inland in the valleys and Coast Range, and on the northern Channel Islands were the center of an exchange network that connected them with the Southern Channel Islands as well as with people living in the San Joaquin Valley (the Yokuts) and the regions south of the San Gabriel Mountains and extending across the Mohave Desert into what is now Arizona and New Mexico. This exchange network used disk beads as a standardized medium of value. The beads were manufactured from Olivella sea shells mainly by residents of the Northern Channel Islands. The Olivella shell beads were drilled with chert drills that were also manufactured mainly by people dwelling on Santa Cruz Island where there were quarries containing a kind of chert that was particularly appropriate for making the drills. The shells were cut and roughly shaped, and then drilled and strung and then sanded to roundness by rolling on a rough flat surface until they were small and uniform. This took a lot of work, and households on the Channel Islands spent a good deal of their labor time producing these beads, which they then used to obtain vegetable foods from the mainland that were in short supply on the islands. The Chumash were a linguistic group that spoke related, but sometimes unintelligible dialects of a family of related languages. The largest Chumash villages were located near fresh water sources on the coast. Villages on the islands and in the interior were smaller. We contend that both the Pomo villages and some of the Island Chumash villages were semiperipheral in a system that had a settlement size hierarchy as well as differences in wealth. The largest villages on the northern Channel Islands were smaller than those on the mainland coast, but there were also smaller villages on the islands. 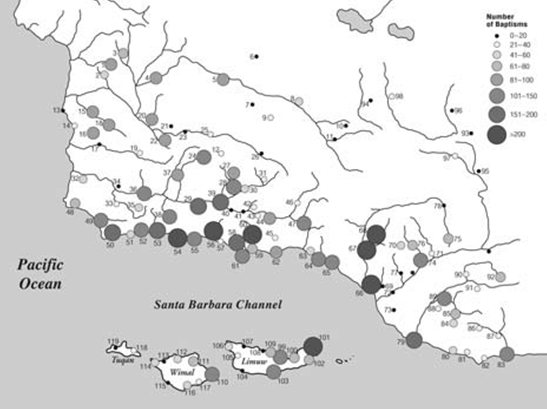 The villages on San Miguel Island, the northern-most of the Channel Islands, were quite small (Figure 1 below from Gamble 2006:71 Figure 7). We contend that the Island Chumash in the larger villages on Santa Cruz Island were in a semiperipheral position vis-à-vis the smaller villages on the islands and the larger villages of the mainland coast. And we also contend that the Pomo were in a semiperipheral position vis-à-vis the smaller villages of adjacent Coast Range peoples and vis-à-vis the larger Patwin villages in the lower Sacramento River Valley (King 1978). Population density is an important dimension of power in systems in which warfare and production technologies are not very different across groups. The winners in intergroup conflicts are those that are able to quickly mobilize larger numbers of fighters to either attack or protect from attack. Village size is the best indicator of population density in settlement systems of the kind found in indigenous California. Figure 1: Population estimates of village size based on mission register documents. Source: Gamble 2006: 71. It is widely agreed in the anthropological literature that generalized reciprocity (sharing) and balanced reciprocity (gift-giving) were the major institutional forms of exchange in both Northern and Southern California. Proto-money (clam disk shell beads) in Northern California was primarily owned and exchanged by village headmen who wore it to symbolize their status (a prestige good) and used it to trade for food and other needed materials from the head-men of nearby villages. Exchanges of this kind took place primarily at trade feasts in which groups from the surrounding region were invited to eat, dance and gamble. This was mainly balanced reciprocity in which headmen were striving to demonstrate their generousity. Anthropologists contend that the complexity and stratification in Chumash society was reproduced by a system of redistribution in which chiefs and members of the elite ‘antap societies and canoe-owners were able to extract food and other resources from non-elites. The Chumash trade feasts required chiefs from other villages to bring substantial amounts of food to the celebrations to help feed the attendees and to pay the dancers. The feast-holders’ reputation for hospitality was an important product of these events, but there was also an element of coercion. For mortuary ceremonies the ‘antap society allegedly appointed a “poisoner” whose job it was to poison one of the attending wealthy men from another village in order to motivate the provision of substantial contributions (Gamble 2008:198). Redistribution was also evident in the Brotherhood of the Tomol, the craft guild that both constructed and owned the plank canoes (tomol) that made it possible to fish in the ocean and to carry out the trade with the Channel Islands. When a load of fish was brought home, the whole load was taken to the canoe-owner who then distributed it to his subalterns. So both reciprocity and redistribution were important parts of the Southern California political economy. But what about market exchange? Clarence King (1976) and Lynn Gamble (2008) contend that market exchange was a significant component of the Chumash economy. Of course it is easy to suppose that observers from a highly commercialized economy (ours) might project their own institutional meanings on to a system that was in reality quite different from their own. The very existence of proto-money suggests market exchange. But did market exchange really exist in the indigenous Chumash system, and if it did, was it a significant component of the whole economy? The archaeological evidence clearly shows the emergence of the shell bead industry and trade network and the concentration of production on the Channel Islands. Archaeologists also note that there was a trend over time toward the increased production of callus beads, in which a harder and thicker portion of the Olivella shell was used to produce a distinctive kind of bead with a bump that was easily perceived when the beads were strung together (Pletka 2004). This bead was perceived as more valuable in the Chumash system. The standard length of strung beads was the “ponco” which was two turns of the string about the wrist and the extended third finger (Gamble 2008:223; see also King 1976:297). Jose Longinos Martinez wrote in 1792: “The value of the ponco depends on the fineness and color of the beads, ours being held in the greatest of esteem; it also depends on their abundance and their price relative to ours” (quoted in Gamble 2006:223). Martinez is referring to the glass beads introduced by the Spaniards for purposes of trading with the Chumash as “ours.” But this quotation implies that different kinds of beads had different exchange values and this was likely to have been the case before the arrival of the Spaniards as well. This would explain why the islanders shifted production from the bead made from the thin part of the shell wall to the thicker callus beads. It was like printing five dollar bills instead of one dollar bills. Or at least this is what we would tend to assume. Gamble specifies what she thinks would have to be the case if true market exchange were to be present in the Chumash system: “Were the principles of supply and demand present in Chumash transactions both within their boundaries and beyond? Were individuals free to exchange beads for goods that they needed and desired, or was the release of beads controlled?” (2008:227). had worked for a hacienda in Ventura. Harrington’s latter-day informants provided valuable information about the Chumash languages, and the stories they told about the old times were suggestive, but disentangling indigenous versus colonial institutional forms of economic exchange from the statements of such informants is exceedingly difficult because the “memory culture” is likely to have gotten distorted by the institutional structure of the colonial culture. Of greater value are the reports of observed behavior by the early explorers and observers in the sixteenth and eighteenth centuries. Both Gamble and King quote instances in which Spanish soldiers were able to purchase food and prestige goods such as carved soapstone bowls from the Chumash using glass beads. These events support the notion that some market exchange did exist in the in the Chumash system. Gambling is mentioned by Jose Longinos Martinez (quoted in Gamble 2006:223) and is an important activity in Chumash mythology (e.g. Blackburn 1975: 91-3). This may be relevant to the issue of whether or not protomoney was used by other than chiefs in both Northern and Southern California. In Northern California games of chance were an important recreational activity that was engaged in by the general population during trade feasts. This is relevant for the question of whether or not proto-money was used for market exchange by non-chiefs. If it was used for gambling by non-chiefs it may have also been used at least some of the time for the purchase of goods and services from non-kin or distant kin. At many of the villages on the coast of the mainland, as many as half of the population talked the Santa Cruz Island language. The Santa Cruz Island people lived permanently in these villages, like permanent colonists. During the time of harvest, when the acorns, etc. were ripe, many Indians came from the island to the mainland and went inland to gather the wild fruit. Librado’s statement may mean that there were members of the same kin groups residing on both the islands and the mainland. If this were true much of the island/mainland exchange could have been sharing or gift-giving among close kin, like the celebrated “vertical archipelago” in the Andes (Murra 1980). And the practice of direct procurement on the mainland by islanders also demonstrates another alternative to provisioning beside either market exchange or balanced reciprocity. The questions is how significant was the existence of some market exchange for the whole nature of the social economy? Unfortunately it is probably impossible to even make an educated guess about how much of the food and everyday raw materials of average persons were obtained by means of market exchange. The contention by Gamble and King that the Chumash system was more commercialized than was the system in Northern California is quite plausible, but Gamble also says “I believe that the Chumash in many ways were close to being a capitalist society despite the fact that they were non-agriculturalists and lacked a state-level political organization (2008:234). While we are sympathetic to a broader definition of capitalism than that used by Marx (commodity production by means of wage labor) we are not willing to stretch the notion to include the kind of economy that existed in Southern California before the arrival of the Europeans. Gamble (2006:234-235) use Dalton’s (1965) distinction between “marketless, ”“market-dominated” and “peripheral markets “ in which some market exchange and money exist but they do not constitute a major proportion of the whole of production and distribution. She adopts the position that the Chumash social economy was an instance of “peripheral markets.” Gamble (2006:235) also notes that other anthropologists agree the production of disk beads by households on the Channel Islands was probably not monitored or directly controlled by political elites. Regarding the issue of supply and demand, we have already mentioned Sahlins’s discussion of how transportation costs and labor time can play a role in gift-giving exchanges because a successful performance of hospitality requires knowledge of the scarcity and labor exerted to produce the goods that are being given. Both gift-giving and market exchange require knowledge of the relative value of goods. This can be manifested as the functioning of supply and demand even in the absence of market exchange. The existence of even a small degree of market exchange in Southern California would seem to constitute a major challenge to the Polanyian substantivist approach to the evolution of economic institutions in which markets did not emerge until the state-based political economies of the Iron Age. But as with the Kultepe tablets discussed below, Polanyi might have been wrong about the timing and location of the emergence of market relations, but still right about the general notion that an important class of human societies do not have markets and that markets are institutional inventions that emerged under certain conditions. The Kultepe tablets pushed this invention back from the Iron Age to the Bronze Age. The Chumash may push it back to complex sedentary foragers of the Stone Age. If we are right that semiperipheral polities in both Northern and Southern California were the main specialists in the production of proto-money, what might have been the forces that brought this to be? Recall that Sahlins’s (1974:227-30) discussion of primitive money mentions that a standardize medium of exchange may be useful when ecological differences encourage a lot of exchange between distant kin or non-kin. He also mentions the functionality of a durable symbol of value when the exchange “between coastal in inland people where an exchangeable catch of fish cannot always be met by complementary inland products “(230). Fish were involved in both the Pomo/Patwin and the Chumash island/coastal trades. Islanders specialized in fishing and the Patwin harvested the huge migratory flows of anadromous fish (salmon and steelhead) in the Sacramento River. Both cultures dried fish, to make it more long-lasting as a source of protein, but fresh fish must have also been an important trade item. Semiperipherality, as indicated by relatively less population density and less social hierarchy, is also related to ecological marginality. Hill people are usually poorer than valley people, and island people are usually poorer than coastal people because the territories that they inhabit have fewer natural resources that can be used by humans as food. In order to have something to exchange for needed food items (vegetable foods in the case of the island Chumash) the semiperipheral peoples have a greater incentive to spend their labor time producing proto-money. But did these semiperipheral peoples innovate the use of proto-money or did they actively encourage its wide-spread use in intervillage exchange? The shift from thin to thick callus bead production may indicate that there was an element of agential innovation, or at least early implementation, in the case of the island Chumash. And was there a similar phenomenon in the earlier shell bead networks that Bennyhoff and Hughes (1982) found linking Northern California with the western Great Basin? Archaeological evidence could be useful for shedding further light on these questions. Arnold, Jeanne E. 1993 “Labor and the rise of complex hunter-gatherers” Journal of Anthropological Archaeology 12:75-119. ______________(ed.) 2004 Foundations of Chumash Complexity. Perspectives in California Archaeology, Volume 7. Los Angeles: Cotsen Institute of Archaeology, University of California-Los Angeles. _____________2012 “Prestige trade in the Santa Barbara channel region” California Archaeology 4,1: 145-148. (eds.) Global Social Change. Baltimore: Johns Hopkins University Press. Brown, Alan K. (ed.) A Description of Unpublished Roads. San Diego, Ca; San Diego State University Press. M. Arensberg and Harry W. Pearson, Trade and Markets in the Early Empires. Chicago: Henry Regnery. Chase-Dunn, C. and Kelly M. Mann 1998 The Wintu and Their Neighbors. Tucson: University of Arizona Press. Chase-Dunn, C. and E.N. Anderson (eds.) 2005. The Historical Evolution of World-Systems. London: Palgrave. Chaudhuri, K. N. 1985 Trade and Civilisation in the Indian Ocean: An Economic History from the Rise of Islam to 1750. Curtin, Philip D. 1984 Cross-Cultural Trade in World History Cambridge: Cambridge University Press. Douglas, Mary 1990 “Foreword” to The Gift by Marcel Mauss, Translated by W.D. Halls, New York: Norton. Earle, Timothy 2002 Bronze Age Economics: The beginnings of political economies. Boulder, CO: Westview. in Power and Propaganda: A Symposium on Ancient Empires, Mogens T. Larsen (ed.). Copenhagen: Akademisk Forlag. Duckworth (also published in same title and pages, University of Pittsburgh Press, Pittsburgh, 1978). Gamble, Lynn H. 2008 The Chumash World at European Contact. Berekeley: University of California Press. of Anthropology, University of California-Santa Barbara. King, Chester 1976 “Chumash Inter-village Economic Exchange” Pp. 289-318 in Lowell J. Bean and Thomas C.
Blackburn (eds.) Native Californians: A Theoretical Retrospective. Menlo Park, CA: Ballena Press. Mainland. Cambridge: Cambridge University Press. McKillop, Heather 2005 In Search of the Maya Sea Traders. College Station, Texas: Texas A and M University Press. Supplement 1, Greenwich, Conn.: Jai Press. by Karl Polanyi, Conrad M. Arensberg, and Harry W. Pearson. Chicago: Regnery. Polanyi, Conrad M. Arensberg, and Harry W. Pearson. Chicago: Regnery. Museum of Archaeology and Ethnology. Harvard University. Stein, Gil J. 1999 Rethinking World-Systems: Diasporas, Colonies and Interaction in Uruk Mesopotamia. George Dalton. Garden City, NY: Natural History Press. Lumpur: Univ. of Malaya Press. Wolf , Eric 1997 Europe and the People Without History, Berkeley: University of California Press. research/citemp/citemp.html World-systems are defined as being composed of those human settlements and polities within a region that are importantly interacting with one another (Chase-Dunn and Hall, 1997). they are easier to bound than are societies. An even more primordial case of the emergence of protomoney and some market exchange is considered below. A capitalist state is one in which the elites in control of the state accumulate wealth mainly by means of trade and the production of commodities. Capitalism involves ownership of means of production in order to make profits by producing commodities for market exchange. We allow for other ways of mobilizing labor than wage-labor. Thus there can be family and guild capitalism as well as serf and slave capitalism. The first known beads have been found in caves on the South African coast that were produced about 70,000 years ago. Archaeologists (e.g. Klein and Edgar 2002) see this as a marker of the emergence of human consciousness. We use the term “protomoney” rather than “primitive money” to indicate a medium of exchange that is used for payments more generally than most prestige goods, but less generally than in the case with fully developed money that can be used in everyday life by average persons to obtain their main needs. The latter occurs in relatively highly commercialized economies in which wealth, land, labor and goods are highly commodified. Protomoney occurs in systems in which some commercialized exchange has emerged but it is not the main way in which average persons satisfy their needs. Lynn Gamble (2006: Chapter 10) begins the job of systematically comparing the similarities and differences between the Northern and Southern California world-systems. In this paper we focus mainly the question of how world-system position (semiperipherality) is related to the production and use of protomoney, but there are many other issues raised by Gamble’s discussion that need further work. Was the island/mainland trade symmetrical or asymmetrical exchange and how was this trade related to intermarriage patterns? Were the polygynous mainland chiefs wife-takers or wife-givers vis-à-vis the island chiefs? Gamble’s (2006: 297) interesting discussion the tenacity with which California indigenes continued to use their traditional forms of money after the European invasion reports the great labor expended in the production of magnesite tube beads by the Pomo and of their forceful rejection of “counterfeit” glass beads of similar proportions that Russian traders tried to foist upon them. engaging in dangerous procurement treks to Bodega Bay. The Chumash, similarly, spoke several languages within the Chumash family. There were dialects within all the languages, too. There is a big dispute among archaeologists who study the Southern California world-system about whether the emergence of complexity and hierarchy was a punctuated response to a climate change challenge or a gradual process of incremental change (Gamble 2006:51-4; Arnold 1987;2001; King 1990). The literature on the rise and fall of chiefdoms ( (cycling) and the expansion and contraction of trade networks is probably relevant for figuring out what happened in Southern California. 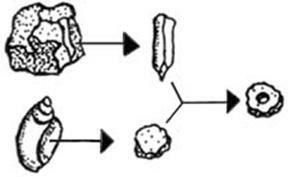 Bennyhoff and Hughes (1987) report evidence of the oscillation of trade networks based on different kinds of shell beads that connected Northern California with the Great Basin. Something like this may have also occurred in Southern California. Gamble (2006: Chapter 10) sees the Pomo and the Patwin as similar with regard to level of complexity and hierarchy, though she acknowledges the specialization of the Pomo in the production of shell bead protomoney. The Pomo not only had smaller villages but they did not have the huge dance houses of the kind that the Patwin built and their version of the Kuksu cult was probably less hierarchical. The Kuksu cult may not be a good representation of precontact ritual orders because it emerged in the period after the indigenous system in Northern California had been radically altered by Euroamerican incursion. John R. Johnson has studied mission records to infer the geographical patterns of intermarriage among Chumash families. It would be interesting to know if there is a pattern, as found between the Wintu and the Yana in Northern California (Chase-Dunn and Mann 1998), of wife-taking from the islands by mainland men, and if this was just done by chiefs (who were often polygynous) or also by commoners. Gamble (2006) does not include a discussion of games of chance in her depiction of Chumash play grounds and recreational activities. Besides the mention by J. L. Martinez are there other eyewitness or memory accounts of Chumash gambling?